2011, March 3rd: Vertigo Rogue v1.2 (iPhone4 Retina support + performance improvements) available in App Store - special introduction price ($0,99) for a couple of days! 2010, August 28th: Vertigo Rogue for Windows released! Get it here, here, here or here! For FREE! 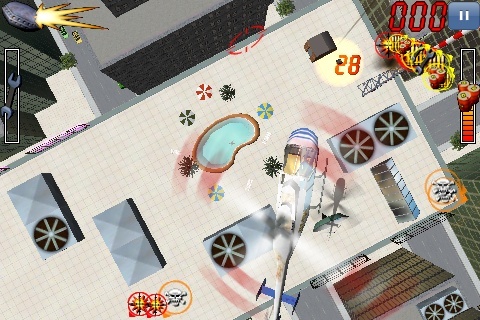 Vertigo Rogue for iPad / iPhone / iPod Touch is an original, fast-paced arcade style action game that puts you in the seat of a heavily armed helicopter taking on a range of land, sea and air based enemies. 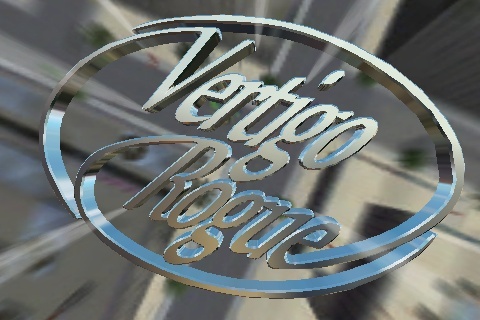 "Vertigo Rogue is an insanely good aerial combat experience and what's even more amazing is that one person managed to create this entire thing alone and squeeze it all into only 5.4 MB. Though the controls have a learning curve, the end experience is truly worth it. If you have any qualms about the price, rest assured you're supporting quality independent developing and getting more than your money's worth." Vertigo Rogue uses a unique two-thumbs control system that allows you to control your helicopter with great precision and flexibility in a very intuitive way. Rather than using the traditional 'D-pad' setup, where each thumb controls movement along 2 axes, the control system in Vertigo Rogue evaluates the input from both thumbs in symphony, and thus adds a couple of extra degrees of freedom: Their relative position horizontically as well as vertically. Just as important, this control system allows you to perform one, several or all of the above actions at the same time! You can move both thumbs forward (making the helicopter fly ahead) but keep one thumb a little ahead of the other (causing the helicopter to turn) while you slide both thumbs to the side (so the helicopter starts strafing sideways), while you decrease the distance between the thumbs (making the helicopter land)! Be aware that there's this thing about helicopters: They are insanely complicated to fly with the 4 analogue axes that you have to master simultaneously. (In first person shooters you also have forward-backward / turning / strafing / duck-jump, but somehow you don't use all 4 equally in full orchestration as you do with a chopper). Control systems that separate these four axes with two on each thumb tend to work badly, because you start having the two brain halves working against each other - you have to think about if the left or the right thumb is used for forward or climbing etc. With this control system, the two brain halves actually cooperate on each movement (or 'gesture' if you prefer) as they are symmetrical. Both fingers are used to pinch the controls, move forward, turn etc. Especially in the stressed situations this will help you a lot - as soon as you get the grip op it, of course. 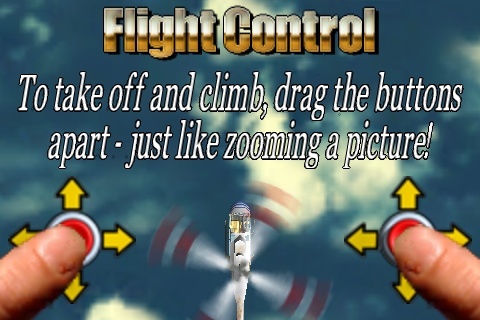 The best advice to get familiar with the controls is simply to keep both thumbs on the screen at all times and then start moving them in very small steps, first a small, equal amount forward to see the forward motion, then back to the neutral position, then climb and back to neutral, turn and back to neutral etc. It's a bit like learning to ride a bike, you need to find the point of balance. Getting comfortable with the neutral position is very important, so you can always regain control of your aircraft - spend a little time practicing this! Soon you can start making larger movements and combining the maneuvers and in a few minutes you will no longer think about the controls but focus on the helicopter and intuitively move it around with great precision. Finger moving off the screen edge and thus the detectable area. There's a small tolerance there, as the virtual stick will be hanging in position for a short time before falling back to neutral (in order not to let the chopper continue its path if you let go of the controls). Forgetting to keep the fingers on the screen surface. I know that's a hard one, because in most games you do the opposite, but it's the price for having the ('reversed') tapping for shooting and changing weapons instead of dedicated 'shoot' and 'weapon' icons taking up space in the screen corners (and worse: dedicated icons would force you to let go of the controls for a longer time when shooting). Unfortunately no single control system fits all, and in the feedback I get, I see a divide in how well people plays with it. When and if I find another control system that competes with this one, I'll add it - and I'm open to suggestions! Not much to it, it's just quickly tapping the right thumb. The most important thing is what was described in the previous section: Keep both thumbs on the screen! 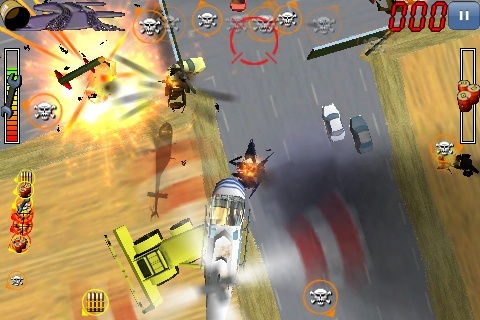 You don't want the helicopter to veer off because you let go of the controls, so even if you tap several times to fire a round of bullets, the last tap should end with the finger placed firmly on the screen, ready to continue the maneuvering of the helicopter. Don't think about aiming like you have to lift your thumb while preparing to shoot - then you'll lose the controls. Wait until the actual moment of firing, and then 'untap' the screen only for a split second to let the shot go off, so the finger is back on the controls immediately. The machine gun is special in the sense that - when tapped - it starts firing a number of rounds for a second or two. If you tap again before it stops, it will continue shooting for an additional second or two etc. This means that to fire the machine gun you need not tap it once per bullet but just at a steady pace around once per second to make it keep shooting. Exactly the same as shooting (see previous section), just with the left thumb. You should not move your thumb to the upper left corner to tap the 'current weapon' icon (even though that would work too), just tap with the left thumb whereever it is placed, and regain your grip on the controls. Tapping the left thumb will change to the next weapon, cycling through all your available weapons - but skipping the ones that are out of ammo! This is a feature that can be turned on and off in the Options menu. It lets you tilt the camera slightly in a gyroscope-like-way using the built-in accelerometer. It is not a particular useful feature, but it makes it possible to make quick glances to the side and it gives the game just a bit more vivid feel when you can more or less see your helicopter from different angles. Oh, and in case you ask: Why didn't you use the accelerometer for controlling the helicopter? Well, it's not nearly as flexible as the two-thumb control system, you can't fly and aim precisely enough with it and, in e.g. bright daylight conditions, it would force you to hold your device at angles where you would get bad reflections in the screen. Music can be turned on and off in the Options menu, mostly to allow you to continue listening to your own iPod music while you play the game. Sound effects cannot be turned off, because they are a very integral part of the gameplay, notifying you of enemies approaching from the side. The 38 missions are divided into a prologue, 6 chapters with 6 missions each and an epilogue. The chapters must be played in a sequential order, but the order of the 6 missions in each chapter is up to you to decide - you just have to complete all 6 missions in a chapter to unlock the next chapter. Completed missions are indicated by a green check mark, uncompleted but available missions have a yellow road sign, and locked missions have a red stop sign. When starting the game, you are prompted to select one of three skill levels (easy, normal or hard). Each skill level represents an individual campaign with respect to completing, unlocking and saving missions, so if you e.g. have completed the first 4 chapters in the easy mode, it does not mean that you get access to more than the first mission in normal and hard mode - and vice versa. 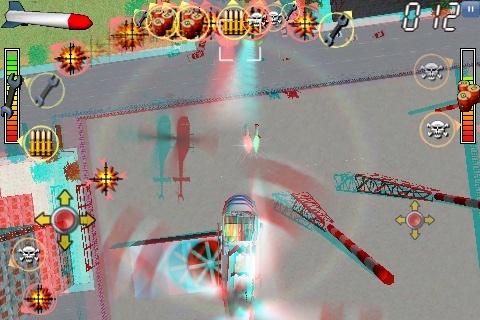 Vertigo Rogue features a stereoscopic, color coded 3D mode for use with common 3D goggles with red/blue or red/cyan filters (red on left eye). 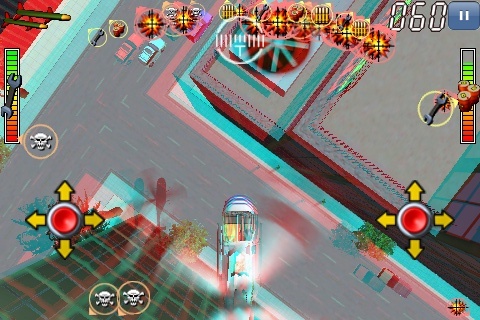 You enable the 3D mode simply by selecting "Stereoscopic 3D" in the Options menu. 3D glasses are of course not provided with the downloaded game, but if you happen to have a pair of those old cardboard goggles around, turn on the 3D mode and enjoy the REAL vertigo effect! The effect is fun and cool, but it is not essential to the gameplay, so use it once in a while for your amusement, but give your eyes a break every 5 minutes or if you feel any kind of headache, dizziness, eyestrain or other discomfort coming up. If you or anyone in your family has experienced symptoms linked to an epileptic condition, or if you lack vision in one of your eyes, don't use this feature at all. Keep an eye on the red 'Mission Objective' icons, these are the ones you have to deal with to complete the mission. The orange 'Enemy' icons are not mandatory kills in order to complete the mission - even though you may sometimes find it virtually impossible to get to the mission objectives without clearing the area of enemies first; or you can use them for target practice if you want; or you can simply be a coward and run away from them. Your call. Yellow icons are the ones to look out for when you run out of ammo (weapon powerups) or when you hear the warning alert and see the fuel or the damage gauge flashing (fuel and repair powerup). Also keep an eye out for new mission objectives or green landing spots that turn up in the middle of a mission, e.g. after completing a primary objective. One piece of advice when fighting air-to-air: Get on top! 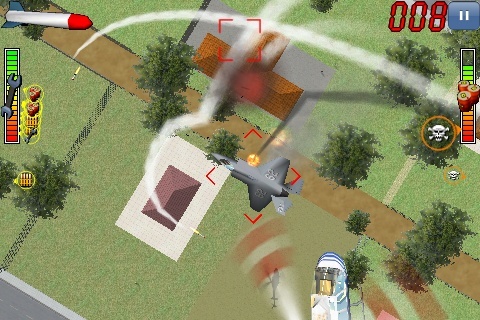 Use homing missiles - but wait for a good aiming position and the locking mechanism to kick in (changing from beeping to a steady tone) and then fire only one at a time - if you fire two and the first one strikes the target, you will blow the enemy out of the way and the second missile will probably miss; machine gun and rifle are also effective weapons against flying enemies; rockets are slower and thus more difficult to aim at a moving target. 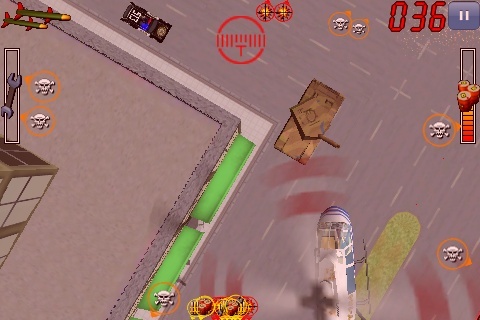 Take cover from flying enemies in the streets between highrises - but beware of tanks in the streets; and don't stay for too long, you'll get caught and have very limited options to escape once they find you and start attacking. If you experience a crowd of shooting people on the ground or on a rooftop, approach slowly from a distance, pick out people on the perimeter of the crowd and take them out one by one. If you move in over the crowd, you are defenseless and being targeted from all sides at the same time. If you have explosives, go to a high altitude and drop it on the crowd from above. If you have anti-personnel gas grenades, throw them into the crowd and then start circling around them at a low altitude to blow the smoke in all directions and knock out the entire crowd. If you have to pick up a power-up from ground in a danger zone, move in quickly and make a quick, ascending escape in any direction; just keep moving to avoid getting hit. Look out for masts and poles that may interfere in bad ways with your rotor. To strike non-moving or slow-moving enemies in open areas, go as high as possible and deploy your munitions onto the target from above in safe distance from retaliating fire. Get behind the car flying relatively low and adjust your speed so you follow the car, then keep the car in the crosshairs and keep firing (machine gun or rifle would be fine). Beware of enemies jumping from exploding cars and fighting back from the streets. With their narrow profile, motor cycles are difficult to hit with guns from behind; if the streets are wide enough, fly up on the side of the MC and direct the helicopter nose against it, so you're flying sideways while following it. Now you have a clear shot for emptying a couple of rounds into the motor cycle, bringing it to a grinding halt. Don't attack a warship if you don't mean to engage, they will fire back at full power. 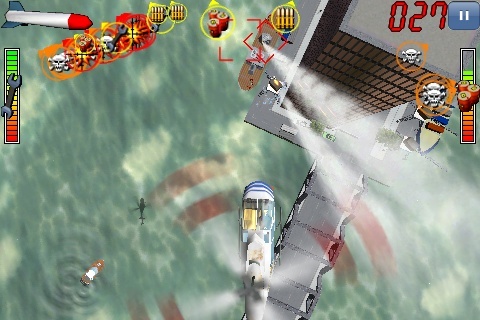 When battling them, aim directly for the cannons preferably with missiles or bombs. If running out of ammo, and you have no weapon power-ups in the vicinity, you can always take a chance and see if you can blow up a row of closely parked cars in a parking lot with the last of your ammo; Parked cars - and containers - may hold caches of ammo, fuel or repair kits for you to pick up. 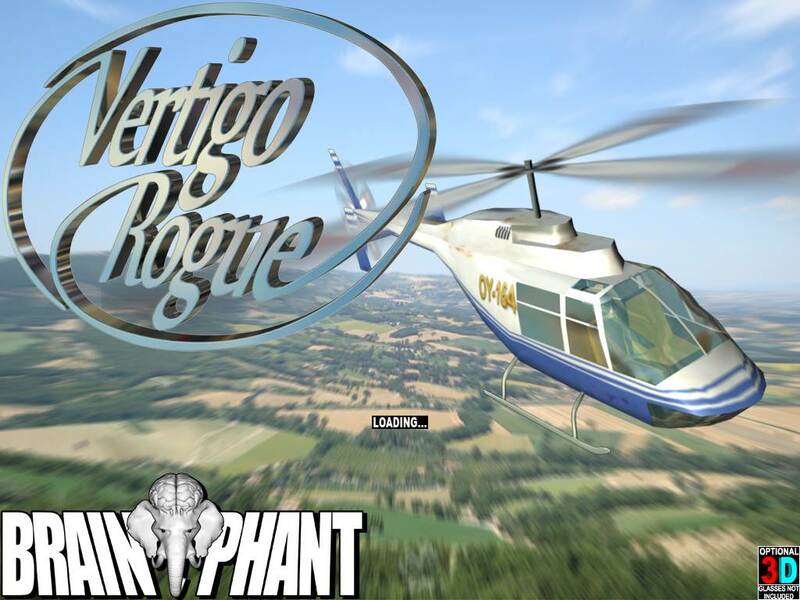 Vertigo Rogue was made entirely as a one man project with passion and with the intention to create a game with such a depth, substance and variation that it would at least provide the average gamer a couple of hours of fun and challenge - and hopefully a lot more. Creating an almost retro-style arcade action shooter - rather than following trends - on an excitingly innovative platform, paying attention to detail and generally trying to do more with less has been an exciting and entertaining task, one which I look forward to repeating if this game earns anything more than a mediocre reception. I believe that developers in respect for their customers have an obligation to put either genius or hard work into a product that they ask people to pay good money for. Many games today provide neither. That Tetris was truly genius and the best game since chess, doesn't mean that any 'match-three-colored-bricks-game' hacked up in two weeks is genius, and adding a time bomb mode or a dancing rodent to the concept does not change an awful lot, especially not for the better. Now, I for one do - unfortunately - not know how to put genius into a game, but through the course of this project I have worked hard to put in that extra variation and that additional layer of detail that will hopefully give you some entertaining moments, not just for the first two minutes, but as a little surprise or a little entertaining combination of events once in a while, even after you completed the game the first time. So go ahead, enjoy the game for as long as it lasts, feel free to send me a note if you find anything particularly good or bad or if you have any suggestions for things you would like to see in my next game.